This an all new compound bow for 2019. The Divergent is designed exclusively for the whitetail bow hunter. Exceptional performance is assured. This is an amazing entry-level compound bow equipped with basic tackles. It is particularly desirable, since 75% of the draw weight can be released at full extension. Its size, 28 inches from axle to axle, balances nicely for a wide range of body sizes. It shoots so smoothly that you can get away with a few minor flaws in form. Its proprietary hybrid cam system ensures level nock travel, aiding consistency, and its integral dampening system cuts noise and shock. If you are a beginner bow hunter with hardworking practice, you would probably learn the art as well as obtain enough basic skills to begin hunting with this amazing masterpiece. This uniquely made compound bow features a shrewd combination of construction, components, and materials. Each section of the bow is made of high-quality materials. It comes with heavy-duty riser-cage that not only gets rid of flex, but also reduces weight in order to maintain structural integrity. Its super short axle to axle length of 28 inches makes it extremely maneuverable; whether you are on a ground line or in a tree stand. It is also remarkably lightweight. It has a variable draw length (25.5 to 30 inches). If you are just starting in archery, your draw will increase effectively, since you have room for expansion. With the 70 pound draw weight, you generally don’t have to shoot heavy, stiff arrows to get good arrow flight. So, you gain more in trajectory. The brace height is 6.5 inch, which is not too low/high. This provides better accuracy and consistent for superior performance and tune. The Bear Divergent is outfitted with hybrid cams that are high performing. The cams are incorporated with exceptional draw dial modules, which allow you to effectively adjust the draw length without necessarily using a bow press. Apart from cable stops, the hybrid cam system promotes a let-off of 75%. This together with the smooth draw cycle, store plenty of energy to propel arrows to your target. The distinct benefit of the hybrid cam system is the level knock travel and the syncing of the two cams without the problems of timing associated with other cam systems. 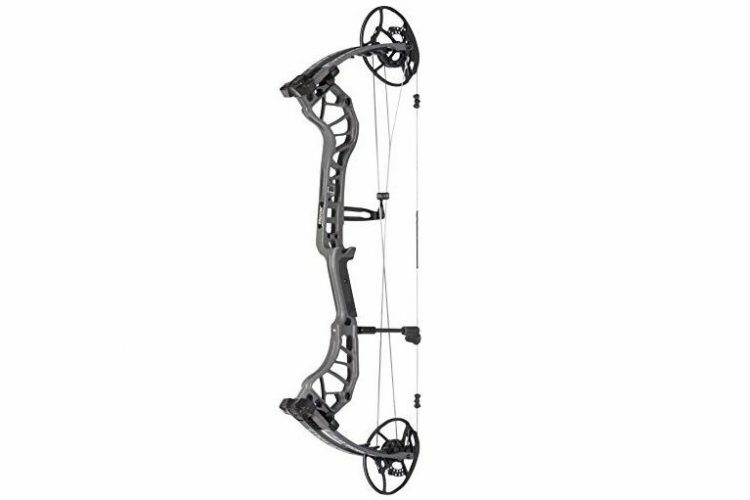 The Bear Divergent provides bow hunters with superior performance at a remarkable price point. You get excellent speed as well as accuracy. From a hunter’s standpoint, being able to draw your bow without overstated twisting is an important consideration. This is exactly what you get with the Bear Divergent. According to a basic draw weight chart, this bow is suitable for larger male hunters weighing one hundred and ninety pounds or more. In line with the IBO settings and KE Hunting Charts, this compound bow is ideal for hunting all types of game. To find the most suitable arrows for this bow, you need to determine your ideal draw length. Here is how you can measure your preferred draw length. Then choose the arrow length. All you have to do is add 0.5 to 1 inch to your draw length. For a draw length of 25.5”, you should buy 26-inch long arrows. For the 70-pound draw weight, we recommend lightweight arrows weighing 350 to 455 grains, and mid-weight arrows weighing between 455 and 560 grains. Unlike conventional compound bows, the Bear Divergent features pre-installed ready-to-hunt key bow accessories. This is a much shorter compact bow, which will just fit in your pocket. If you are doing a lot of spot and stalking, this is a perfect choice for you. The hybrid cams allow for excellent speed and accuracy. It is very light and very quiet on the draw and on the release. You will love its shockwaves limb dampening system that does an amazing job of eliminating shock as well as vibration. Apart from the right hand model, the Bear Divergent is also available for the left hand. You just have to specify LH or RH.